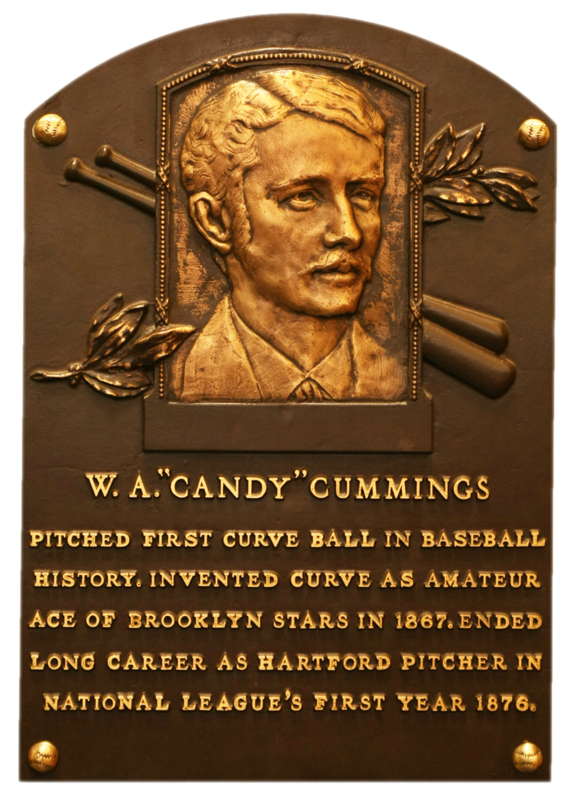 William Arthur "Candy" Cummings was born on October 18,1848 in Ware Massachusetts and went on to be a professional baseball player that was eventually one of the first members to be inducted into the Hall of Fame. What Cummings added to the game of baseball was the addition of a curveball to a pitcher's repetroire and the addition of a glove for the catcher to catch the ball with. When Cummings pitched the pitcher threw underhand and was essentially there to throw the ball where the "striker," or more commonly known as the batter today, wanted the ball to be thrown. The story goes that one day as a teenager Cummings was throwing clam shells into the ocean when he learned to added a bit of a curve to the shell when he threw. Cummings tried this with a baseball as a member of the National Association of Base Ball Players team the Brooklyn Excelsior's. Cummings pitched with Brooklyn in 1866 and 1867 before pitching for the Stars of Brooklyn from 1868 to 1871. The problem with the curveball at that time was the fact that the catcher stood twenty feet behind the batter to catch the ball without a glove. When the curveball hit the ground it would skip away allowing runners to move up or score which led Cummings catcher, Nat Hicks, to stand behind the batter and catch the ball on the fly. Hicks and Cummings came up with the idea of the catcher having leather bound gloves with the fingers cut out of them to help with catching the ball and saving the catcher's hands. The sport of baseball was in its infancy at the time but within a few years the way the pitcher played the game was changed, the pitcher's repertoire was changed, the catcher position was changed and how the catcher did his job was changed. All because of a 17 year old kid throwing sea shells by the sea shore that just loved playing this great game of baseball. Cummings was elected to the Hall of Fame in 1939. Now the Yankees know why they have those gloves on their hands and now it's time to start using them. Thanks.